Mutual Funds are pools of money collected from many investors for the purpose of investing in stocksStockWhat is a stock? An individual who owns stock in a company is called a shareholder and is eligible to claim part of the company’s residual assets and earnings (should the company ever be dissolved). The terms "stock", "shares", and "equity" are used interchangeably., bondsBond TranchesBond tranches are usually portions of mortgage-backed-securities that are offered at the same time and usually carry different risks, rewards, and maturities. For example, collateralized mortgage obligations (CMO) are structured with a number of tranches that mature on different dates, carry varying levels of risks, or other securities. 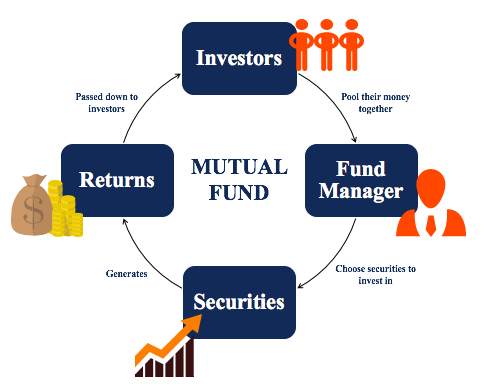 Mutual funds are owned by a group of investors and managed by professionals. In other words, a mutual fund is a collection of securitiesAsset ClassAn asset class is a group of similar investments. Different classes of investment assets – such as fixed income investments - are grouped together based on having a similar financial structure, and because they are typically traded in the same financial markets and subject to the same rules and regulations. owned by a group of investors and managed by a fund managerPortfolio ManagerPortfolio managers manage investment portfolios using a six-step portfolio management process. Learn exactly what does a portfolio manager do in this guide. Portfolio managers are professionals who manage investment portfolios, with the goal of achieving their clients’ investment objectives..
Money market funds invest in short-term fixed income securities. Example of short-term fixed income securities would be government bonds, Treasury bills, commercial paper, and certificates of deposit. These types of fund are generally a safer investment but with a lower potential return than other mutual funds. Fixed income funds buy investments that pay a fixed rate of return. This type of mutual fund focuses on getting returns coming into the fund primarily through interest. Equity funds invest in stocks. Furthermore, there are different types of equity funds such as funds that specialize in growth stocks, value stocks, large-cap stocks, mid-cap stocks, small-cap stocks, or a combination of these stocks. Balanced funds invest in a mix of equities and fixed income securities – typically in a 40% equity 60% fixed income ratio. The aim of these funds is to generate higher returns but also mitigate risk through fixed income securities. Index funds aim to track the performance of a specific index. For example, the S&P or TSX. Index funds follow the index and go up when the index goes up and goes down when the index goes down. Index funds are popular as they typically require a lower management fee compared to other funds (due to the manager not needing to do as much research). Specialty funds focus on a very small part of a market such as energy, telecommunications, healthcare, industrials, etc. Mutual funds are actively managed by a professional who constantly monitors the fund’s portfolio. In addition, the manager can devote more time in selecting investments than a retail investor would. Mutual funds allow for investment diversification. A mutual fund invests in several asset classes and not just a single stock or bond. Mutual funds possess high liquidity. In general, you are able to sell your mutual funds within a short period of time if needed. Mutual funds typically charge a high MER (management fee and operating expenses). This would lower the overall return. For example, if the mutual fund posted a 1-year return of 10%, the MER would lower this return. Since mutual funds are managed by a manager, there is a loss of control when investing in a mutual fund. Remember that you are giving someone else your money to manage to when investing in a mutual fund. Mutual fund returns are not guaranteed. In fact, according to research, a large majority of mutual funds fail to beat major market indexes like the S&P 500. In addition, mutual funds are not insured against losses. Develop your carer as a professional financial analystFMVA™ CertificationThe Financial Modeling & Valueation Analyst (FMVA)™ accreditation is a global standard for financial analysts that covers finance, accounting, financial modeling, valuation, budgeting, forecasting, presentations, and strategy. with CFI’s online financial modeling and valuation courses. To advance your career, these additional resources from CFI will be helpful.